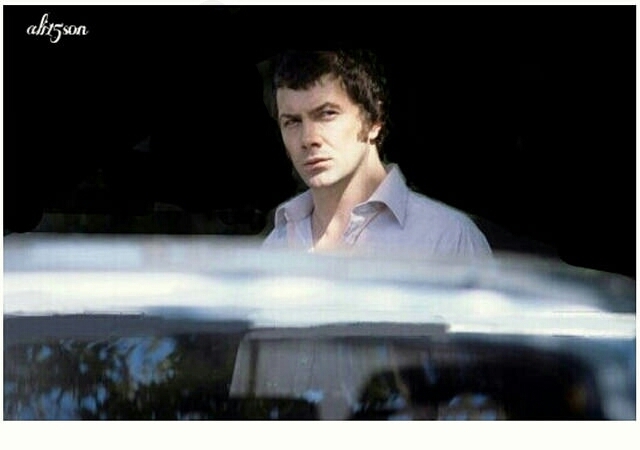 LEWIS COLLINS.....this makes me sooo happyyy - BODIE 3.7 . you'll never walk alone ! I like the puzzled look and open shirt. Thanks. thankyou yes i'm looking at that ooen shirt infact i keep going back for another glance ...thankyou so much for looking and glad you like it . That *is* a very nice picture! All the ones you've posted today have been great, thank you! thankyou very much , i'm so glad you like all the pics i have put in my journal today and thankyou for looking at them all . It's such a great picture, thank you. thankyou and you are very welcome , glad you like it and thankyou for looking . As always a wonderful picture. I love the way he looks. I think he sees his Doyle speaking with a stranger. And sorry that I didn't commented so much in the last weeks, but I'm very busy at the moment. thankyou , yes i love the open shirt and perhaps Doyle would be wise not to speak to strangers when Bodie is around . I'm sorry to hear you have been so busy but it's lovely to hear from you . Ooh, lovely picture! I like the way his head is framed in the black background, and I love the open-necked shirt. Great, thank you! thankyou , yes the open neck shirt is doing wonders for my eye sight infact it keeps giving me cause to go back for another glance and then i get to thinking just what that look of Lewis is being directed at ..is he searching out Martin in the distance . Thankyou so much for looking at this. And it makes us happy, too! What a great photo--very inspiring. Thank you! thankyou, oooh i'm glad this makes you happy too because it's making me go weak kneed every time i see that shirt open to (damn that car roof being in the way) atleast three buttons down . If this inspires anything then i'm all in favour . Thankyou so much for looking and liking . I can see why! Seeing him here has improved my day :) Thank you. oh i'm possitively drooling at this image of a Lewis with so many buttons undone on his shirt , i'm so pleased this has improved your day because it's made mine a whole lot better . Thankyou so much for looking and leaving a comment . thankyou , yes i know exactly how you feel infact at one point i think i forgot to breathe and nearly fainted but if only that car roof wasn't in the way . So glad you like it and if you want me i am just collapsed in a heap on the floor *g*. Many thanks to you for taking a look . Beautiful, sultry, pensive, with a touch of vulnerability... a great image! thankyou , yes a very puzzled looking Lewis with just a touch of vulnerability as though he's looking for Martin and can't quite see what he's looking for and that shirt just does it for me every time . So glad you like it and thankyou for looking . I wasn't very awake - and then I saw this, LOL. you are very welcome and that open shirt on this gorgeous man is enough to bring anyone into instant awareness . Thankyou so much for looking and leaving a comment .